MOSCOW (Sputnik) – Juan Guaido, the leader of the Venezuelan opposition-run parliament, proclaimed himself on Wednesday the country's acting president, showing the world how to turn from a little-known politician to a major threat to the country’s legitimate President Nicolas Maduro just in three weeks. Just a decade ago, Guaido was an engineering student, while today he is viewed by thousands of protesters in Venezuela as the country's leader. Guaido was born on July 28, 1983, in a large family of a pilot and a teacher in the Venezuelan city of La Guaira. When he was 16, he witnessed one of the worst natural disasters in Venezuela’s history. In December 1999, the state of Vargas, where Guaido lived, was hit by severe flooding. As a result, tens of thousands of people died, including many relatives and friends of the future opposition figure. Years later, Guaido was dubbed "survivor" by the Venezuelan media — an allusion to the 1999 Vargas tragedy. In 2007, Guaido graduated from the Andres Bello Catholic University with a degree in industrial engineering. He was one of the board members of the university's student engineering centre and was recognized for his outstanding academic achievements. Later, Guaido continued his studies and obtained master’s degrees in public administration at the Institute of Advanced Studies in Administration in Venezuela and at the George Washington University in the United States. Guaido became interested in politics while being a student. In 2007, he led student protests related to the closure of the RCTV broadcaster, which was in opposition to the government of the then Venezuelan President Hugo Chavez. He actively participated in the movement against the constitutional referendum that amended the country's main law to launch Venezuela's transformation into a socialist country the same year. Guaido, along with other local leaders, became a representative of the so-called Generation 2007, a student movement, whose members expressed their concerns over the situation in society. In 2009, Guaido, along with the former mayor of Caracas, Leopoldo Lopez, became a co-founder of the Popular Will centrist party. In 2010-2015, he was an aide of a National Assembly lawmaker. In 2015, Guaido was elected a member of the national Assembly himself. In 2018, he spearheaded the opposition coalition named the Democratic Unity Round Table (MUD). Being a member of the Venezuelan parliament, Guaido headed an inspection commission investigating high-profile corruption cases, such as the Odebrecht construction company bribery case, involving officials of Maduro’s government. Odebrecht, the largest construction and development company in Latin America, admitted in 2016 that it had spent hundreds of thousands of dollars on bribes in 12 countries of the region to win government contracts. On January 5, Guaido was elected to head the Venezuelan National Assembly. According to local media, that happened largely by accident since virtually no other candidate could compete with Guaido at that moment. Leopoldo Lopez, a brilliant and charismatic opposition leader, has been under house arrest since 2017, while his right-hand man Freddy Guevara has been hiding from the authorities. Just two weeks after taking over the parliament, Guaido proclaimed himself the acting head of the Bolivarian Republic. The United States was quick to recognize Guaido as the country's acting president and demanded that Maduro, whose presidency was deemed illegitimate by Washington, should prevent any forceful acts against the country's opposition. Maduro, in turn, reiterated that he was the country's constitutional president, legitimately elected by the Venezuelan citizens, and accused Guaido of being Washington's puppet. 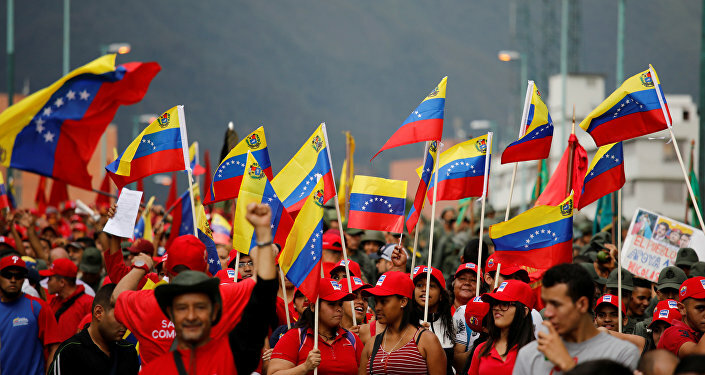 Experts shared Maduro's opinion in their comments to Sputnik, suggesting that Guaido might be following a script written for him by the United States. "Guaido is not known for anything apart from being the parliament's speaker. He is a man who openly follows the scenario elaborated by Washington. It is absolutely clear that the United States promotes him in order to topple Maduro", Igor Pshenichnikov, an expert at the Russian Institute for Strategic Studies (RISS), told Sputnik. Evgeny Pashentsev, a senior researcher at the Centre for Euro-Atlantic Studies and International Security at the Institute of Contemporary International Studies (ICIS) of the Diplomatic Academy of the Russian Foreign Affairs Ministry, in turn, suggested, that Guaido self-proclaiming himself Venezuela's acting president put Venezuela in a situation where the country is vulnerable to interference by foreign states.